In Part I, the five main faults in the region around the Levant were discussed: the Red Sea spreading ridge and its associated triple point, the Dead Sea transform fault, the Zagros suture, the Anatolian strike-slip fault (actually two near parallel faults), and the Aegean subduction zone. Every type of fault that is known occurs around the Middle East! Perhaps that should not come as a surprise. The faulting started in Afar, where a hot spot appeared 30 million years ago. The swelling formed a triple point. One of the three arms is the Red Sea which developed into a new spreading ridge, which is still slowly extending further to the northwest. The Arabian peninsula began to move north, pushing into Asia: the continental collision between Arabia and Asia formed the Zagros mountain ranges running from southern Iran to the virtual country of Kurdistan. The forearc region to the mountain chain subsided and formed the low plains of Mesopotamia, with the Tigris and Euphrates, as well as the Persian Gulf. The Dead Sea fault formed to accommodate the northward movement of Arabia, sliding past the African (Mediterranean) side). The southern tip of Sinai looks vaguely like another triple point but it isn’t. The Anatolian plate is being pushed westward by Arabia, and this motion is powering the Anatolian fault. The Aegean sea is a separate microplate, consisting of thinned continental crust (which is why it has dropped below sea level), which is moving southwestward, overriding the oceanic crust of the Mediterranean. It has formed an island arc, one of four that exist in the Mediterranean. The tectonics are as rich as it gets! So where are the volcanoes? Not all fault types are volcanically active. Volcanoes typically form if the crust is weakened, allowing mantle heat to rise up, or if melt occurs at depth, with the lower density melted rock coming up by buoyancy. The weakened crust happens in spreading centres, and the melt happens in subduction zones, in regions of extensions, and above hot spots. The melt in subduction zones is caused by hydrated oceanic crust sinking into the hot mantle, and in extension regions it comes from decompression melt. Strike-slip and transform faults do not usually form volcanoes. However, once melt exists, faults that are not normally volcanic can still provide the magma with a way to the surface. All of this happens in the Levant and Middle East. The spreading ridge of the Red Sea is delineated by volcanoes, although not in the northwest closest to our area of interest where the spreading is too early in its development. Famous Erta Ale is south of the Afar triple point. The Aegean Sea has all the requirements for volcanoes, and indeed does have them, including infamous Santorini. The forces acting on the Arabian plate has caused an area of extension midway within it, which runs parallel to the Red Sea: voluminous volcanic fields are found there. No volcanoes are associated with the Dead Sea fault, and there are none between this fault and the Mediterranean coast. Further north, things grow more complex. There are some areas of extension in Turkey, Armenia and Georgia, where impressive volcanoes have grown. These have in fact helped fertilize the fertile crescent: the orchard of Eden, and the early agriculture was fed by volcanoes. The map above shows the local distribution of volcanoes; the most notable concentrations are in eastern Turkey and along the Red Sea. The Aegean sea volcanoes are off the map. There is another cluster south of Damascus, which will be discussed further below. The coastal area from Lebanon to Egypt is volcano-free. An extract of a table from Sarah Brown et al. Top row lists volcanoes with recent activity, middle row with Holocene activity, and bottom row no eruption record but potentially eruptible. PEI refers to the size of the population exposed to volcanic risk: PEI classes 6 and 7 indicate high populations. The volcanic activity varies per volcano, as it always does. But the centres here are not highly active or explosive. The peaks are mostly small cones, often from single eruptions, which have had effusive eruptions of typical size VEI2. The peaks in Turkey have grown much larger and although their eruptions may be more frequent, they are not large. There is no history here of major eruptions. No VEI7’s are on the horizon, and few pyroclastic deposits have been recorded in the region. To find more active or dangerous volcanoes, one has to go to the Aegean Sea on one side, or the Ethiopian rift valley on the other. But although the local volcanoes seem small fry, they are not without danger. Some have been active in the Holocene, and some are in very densely populated areas. One could image what an eruption in the Golan height, within view of Damascus, Haifa, Tyre and Sidon, could do. And the Golan heights are volcanic in nature. The region is not extinct. Wars, rumours of wars, and volcanoes can make an explosive mix. The heartland of Israel and Palestine is non-volcanic, however. This agrees with the ancient promise of a land of milk and honey – volcanoes were not included in the contract. (As the locals are wont to mention, it is also the only region in the Middle East which has no oil. They should have read the small print.) And indeed, volcanic activity in the bible is notable by its absence. The vivid imagery of Job would certainly have made use of volcanic eruptions. But Job spends not a single word on them. But there are volcanoes in the wider region and in principle, they could have been recorded in the biblical narrative, either directly or indirectly. I will argue below that one is. But let us go through the candidates. The main volcanic player in the ancient history of the eastern Mediterranean is Santorini, in the Aegean Sea. It was the most significant eruption in this part of the world within the Holocene, with an estimated ejecta of 60 km3 (VEI 6 – 15 km3 DRE). The ensuing tsunami devastated much of the eastern Mediterranean, as well as fatally weakening the main sea-faring civilization of the region, the Minoans. Down the line, this allowed Greece to begin its development towards cultural dominance. The date of the Santorini eruption is not exactly known. The most likely date is around 1610 BC, with an uncertainty of 20 years. The city on the island, Akrotiri, was completely destroyed, buried under ash which nearby reaches 60 meter in thickness. No bodies have been found in this Pompei of the east, and it seems some attempt was made at repair of collapsed buildings. This suggests there was an initial event, such as a major earthquake or initial eruption, which left enough time to evacuate before the main eruption happened. The ash from the eruption is mainly found in Turkey, north and east of Santorini, suggesting the wind may have been from the southwest at the time. To the south, in Crete, the ash layer is 7 cm thick, still enough to have dramatically impacted agriculture. Most of the damage in the Aegean sea came from tsunamis, especially towards the south and west, perhaps hitting Athens as well. The main civilization at the time were the Minoans, whose heartland was on Crete, directly south of Santorini. Akrotiri itself was also Minoan. The Minoan civilization lost their main harbours and fleet. The civilization survived Santorini but apparently did not fully recover. It finally collapsed around 1450 BC: the eruption and especially the tsunami is likely to have begun their decline. The tsunami was largely contained within the Aegean Sea, with Crete effectively acting as a shield, protecting more distant shores. However, this did not prevent problems further away. The Egyptian fortress city of Thar was destroyed around this time, and volcanic ash and pumice has been found in the ruins. The pumice would have taken some time to get there. Pumice is found in coastal locations across the Aegean Sea and the eastern Mediterranean: after such an island-destroying eruption, pumice mats may have made sea travel difficult for many months. It all happened during an era for which we have little other information. Egypt had just been overrun by the Hyksos (invaders from the east) who were removed again over the next 50 years. All records to their time as Egyptian rulers were removed by the re-conquerors. The bible stories also skip this period, which is during the sojourn as Egyptian labourers/slaves. That story picks up again with Moses, some two centuries after Santorini. There was an indirect effect, though. The demise of Crete opened the doors for other empires to rise. One of those expanded out of the Aegean Sea and came to populate the coasts of Canaan and Egypt. They were called the ‘Sea Peoples’ in Egyptian writings, and eventually show up as the Philistines who stopped Israel’s expansion to the coast. In the Levant, they are the main local beneficiaries of Santorini. Amidst the turmoil of the Exodus, the story tells of a stay at Mount Sinai ((also called Mount Horeb). Here, Moses receives the 10 commandments. The story describes how the mountain is covered in a cloud of smoke, with lightning and thunder mingled with the blasts like a trumpet; at the summit of the mountain was a fire. Is this the description of a volcano or of a thunderstorm? The story places the event in the Sinai but it does not give any idea of the precise location. Modern Mount Sinai is in the mountains near the southern tip of the Sinai peninsula, but this identification was made long after the story itself was written. There is now an ancient monastery, founded by Justinius around 540 AD. 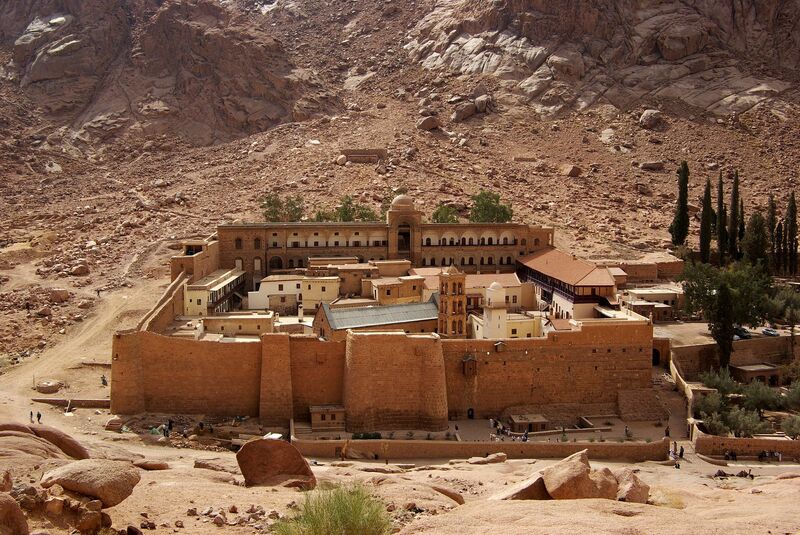 Saint Catherine’s is the oldest working monastery in the world, a Unesco heritage site, and the place where one of the oldest surviving manuscripts of the bible, the Codex Sinaiticus, was discovered: it is now in the British Museum in London. For our purposes it does not matter to much whether this Mount Sinai was the intended mountain. Like Israel itself, the Sinai peninsula is entirely non-volcanic. There have been suggestions that the actual place was outside of the Sinai, in Jordan and Saudi Arabia, but although there are volcanoes there, they are not active enough to warrant associating the description with a volcano. The exodus was volcano-free. 5100-meter-tall Mount Ararat dominates the skyline over Yerevan, capital of Armenia. It is in effect Armenia’s national mountain, appearing on many of its national symbols. But in spite of its cultural inclusion, Mount Ararat is not in Armenia. It is on the Turkish side of the border, and it became Turkish because a land exchange with Iran (don’t ask). Armenia has not laid claim to it – it just uses the image rights. Mount Ararat is fairy active as volcanoes go, with regular volcanic events. Fumaroles remain active and there have been reports that the area of thermal anomalies has been growing in size since 1989. An apparent eruption occurred in 1840, after an M7.4 earthquake on July 2, 1840 which together with a major landslide killed as many as 10,000 people. The evidence that it coincided with an eruption comes from eyewitness accounts, which report an illuminated cloud rising up from the northern summit with a strong smell of sulphur, and small stones being thrown out 3-4 km. The reports mention a cloud of red-lucent dark dust which came down at a great speed from beneath it, destroyed the village of Akory, killed 1900 of the villagers, burned trees in the village gardens, and pulled them out with their roots. The association of such a large earthquake with a significant eruption is unusual, but the earthquake may have triggered a phreatic explosion. The event is listed as a VEI3. An eruption between 2400 and 2500 BC buried a town beneath thick pyroclastic deposits: the town population was apparently killed by it. There is also a report of an events in 1450 on Lesser Ararat, its subsidiary peak. However, so far no Ararat lava has been dated to less than 10,000 years old, and the recent activity may have been purely phreatic. Going back to the topic of the post, Mount Ararat plays a minor role in one of the most famous stories from the bible: of Noah’s flood and ark. The story itself predates the bible: it is described in Babylonian tablets. In the bible version, after the flood retreats, the ark comes to rest at Mount Ararat. Most expeditions which, somewhat optimistically, search for remnants of the ark go here. However, this identification is an anachronism. The mountain did not actually carry that name at the time. The word ‘Ararat’ is a Hebrew translation of ‘Urartu’, the high-land region in present-day Armenia located roughly between Iraq and the Black Sea, which is the source region of both the Tigris and the Euphrates. Modern Mount Ararat itself lies at the northeast end of the region. The region of Urartu was known by that name by around 1300 BC. It became an independent kingdom around 900 and at its peak stretched from the Euphrates to the Caucasus, In the bible, the book of Jeremiah refers to Urartu as the kingdom of Ararat. Literally, the bible says that the ark landed on ‘the mountains of Urartu’. Mount Ararat itself does not feature in the bible, and the story loses a good volcano. After three misfires, now one that is for real. Jeremiah uses an expression that clearly is volcanic in nature, when he the image of a ‘destroying mountain’ becoming a ‘burned-out mountain’ (Jeremiah 51, in case you are interested). He does not say which mountain he had in mind. However, there is only one volcano in the immediate area which is occasionally active, and has a black, burned-out appearance. It is Es Safe, south of Damascus. Large lava fields are called ‘harrats’ in Arabic. There are quite a few of these near the Red Sea. But the largest harrat is further north. The Harrat Ash Shamah runs parallel to the Red Sea, starting at the Golan Heights and extending east and south-eastward into southern Syria, Jordan and finally Saudi Arabia. It is an extensive volcanic plateau, covering more than 50 000 km2 and with a lava pile thickness that reaches 1.5 km in places. The Golan Heights form the western end of the harrat. The many eruptions have left more than 800 volcanic cones across the area. Es Safe is one of the centres of this harrat. The area has been active for the last 24 million years. The lava flows are large but sporadic: one location may show some 20 superposed flows, or one every million years. The youngest activity is in the northern reaches, mainly cinder cones. There may have been Holocene activity in the Golan Heights, but none has been confirmed. The most recent events were further into Syria. Es Safa, an 800-m tall peak in southern Syria, is visible as the black blotch in this google map. It lies 80 km southeast of Damascus. Black is the colour of uneroded, young lava. Indeed, the most recent eruption known in the area was less than 200 years ago, in 1850 when there was an active lava lake. The youngest flows surround the cone. Another lava field between the Golan Heights and Es Safa is carbon dated to 2700 BC; there may have been other recent eruptions. North of Es Safa, two linear sequences of cones show a similar black colour of uneroded lava. Zooming in on google earth reveals multiple lines of volcanic craters. Within the wider area, black-coloured Es Safa is the only real candidate for Jeremiah’s burned-out mountain. But when was it a destroying mountain? The eruption of 2700 BC was too early for Jeremiah to refer to it. 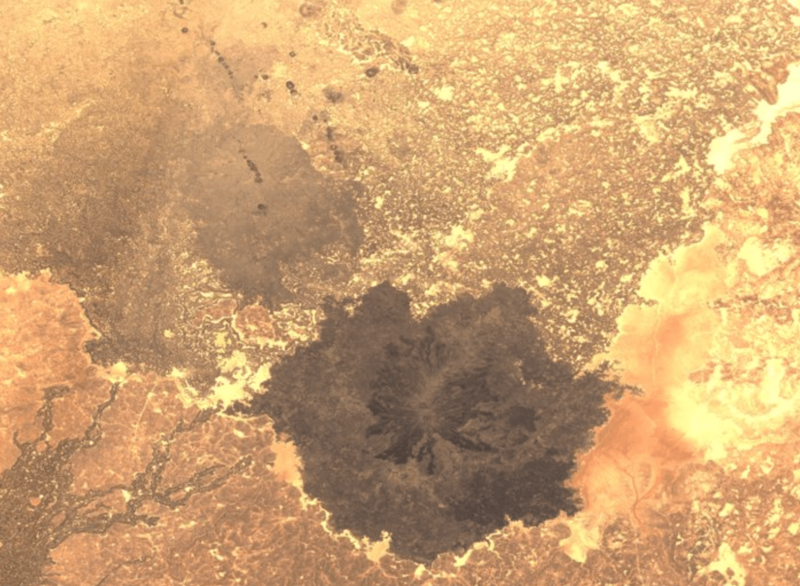 However, there are numerous volcanic craters close to Es Safa, apparently fed from there, and there is a good chance there were eruptions in between. The Dead Sea transform fault is home to one of the wonders of the Earth. Part of the rift has subsided, and between the steep cliffs on either side, the lowest lake on Earth has formed. The Jordan river flows through the rift, from north to south. In spite of the gradient, in most places it flows sedately with a meandering habit. The sea of Galilee is 250 meters below sea level but the Jordan flows through it and keeps sinking. The river finally reaches it low point at the Dead Sea which has no outlet. Water leaves only through evaporation; the salt stays behind. The salt concentration of the Dead Sea water is an incredible 34%. It is called the ‘Salt Sea’ (or ‘eastern sea’) in the bible. In recent decades, as the water flow into the Sea has dramatically declined (the Jordan is only a shadow of itself) the Dead Sea has dropped, currently by 1 meter per year. The surface is now 430 meters below sea level. The little water that comes in carries the pollution from a large area. The Dead Sea is dying. The Dead Sea is not volcanic in origin. But there are stories about it that seem to link to eruptions. How can that be? The volcanic suggestions come from an ancient story, set in the time of Abraham. In some way this story is our oldest literature: it uses a simple plot to tell of a conflict between its main characters. The conflict is between the traditional culture of the pastoralists and the very different city dwellers. The ways of the city are epitomized in the twin towns of Sodom and Gomorrah, in the plains near the Dead Sea. Abraham’s nephew Lot has fallen for the lure of the cities, lost his moral compass and needs rescuing. There is a clear winner in the story, and the cities are destroyed. It would be another 1000 years before Abraham’s descendants themselves became city dwellers. Abraham himself is said to have come from two of the cities of Mesopotamia, Haran and Ur, so the conflict between countryside and city life runs in himself too. Abraham and his family are like an ancient version of Calman Jacoby, the conflicted character of Isaac Bashevis Singer’s family chronicle, The Manor. Archaeology has confirmed that there were major cities on the plains to the east of the Jordan already in the early bronze age. Tall el-Hammam, opposite Jericho, was by some distance the largest, and it had been in existence since at least 3500 BC. But the story does not identify the specific cities. Whether the story of Sodom and Gomorrah was based on memories of a real event, or was devised to explain ancient ruins on the landscape, is not clear. The volcanically interesting part of the story is the manner of Sodom and Gomorrah’s demise: in a rain of fire and brimstone (although it should be noted that the story explicitly states that it is not an eye witness account). The area is not volcanic, and an eruption can be safely excluded. It is in an earthquake zone, and a significant earthquake would fit parts of the story, including people fleeing in blind panic without looking back. So what is this brimstone, and why it is related to fire? Was there a volcanic link after all? ‘Fire and brimstone’ is a well-known expression in the bible, especially if you prefer older translations such as the King James. More recent translations use a more modern word: brimstone is in fact pure sulphur. Pure sulphur burns easily and sometimes was used as a kind of match. 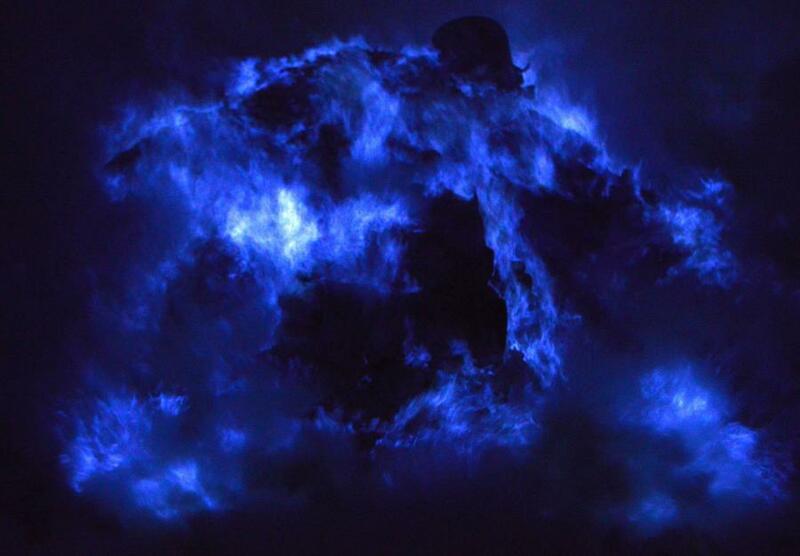 This is referred to in the bible, for instance by Isaiah: ‘A pyre of fire with plenty of wood; The breath of the LORD, like a torrent of brimstone, sets it afire.’ It burns with a blue colour, which is almost invisible in sunlight. The fumes have a very bad smell, are toxic and dangerously irritating. The combination of fire and brimstone refers to this burning sulphur. But it is actually hard to see whether sulphur is on fire in daylight, as our eyes can’t see the blue light well. The smell is much more notable. Sulphur and salt are often mentioned together in the bible, for instance in the book of Deuteronomy which talks about a ‘burning waste of salt and sulphur’. This points at the Dead Sea as the origin of the expression. There are indeed deposits of pure sulphur, mainly around the southern parts of the sea and this is probably what the story is based on. The crusaders mentioned a smell of sulphur around the Dead Sea. Every now and then, an earthquake brings up bits of floating bitumen, ranging in size from rocks to houses. There are reports that the sulphur smell precedes the appearance of the floating bitumen. The upper layers of the Dead Sea waters have very low sulphate. But the lake is often stratified, and the bottom layers can build up H2S. This is released when the water overturns. This happened in the 1980’s and the Dead Sea is currently not stratified. But it can become so again. This combination of sulphur and bitumen is used by Isaiah, when describes the land of Edom which was immediately to the south of the Dead Sea: this area was where the sulphur and bitumen were mined. (The bitumen was exported to Egypt where it was used in late mummifications, after 1000 BC, as a way to protect against high humidity. Our word ‘mummy’ comes from the Arabic for bitumen, ‘mum’.) He writes that ‘Edom’s streams will be turned into pitch and her soil into brimstone; her land will become burning pitch’. This neatly combines all the aspects of the local land, and uses the sulphur to fire up the local bitumen. Obviously Isaiah didn’t like Edom very much, but than, Edom had participated in the sacking of Jerusalem. Middle Eastern conflicts have deep roots. Finally, there is one place in the bible where sulphur relates to volcanic activity. The last book of the bible talks about a ‘lake of sulphur and fire’. It is easy to visualize a lava lake here! But this book was not written in Israel itself. Revelations was written around 100 AD, somewhere in the Mediterranean. By now there were volcanoes known that fit the image. The Vesuvius eruption, Etna, and Stromboli were removed from the Jewish world but within the Roman one. Here, at the end of the bible, do we finally see an image of an erupting volcano with destruction. It was worth the wait. The Levant is an area with fascinating faults and volcanoes. The 4000 years of written history reveal how the faults affected the people. It is a region that we see on the news every day, in bleak events rooted in distant memories. But in that world of hopeless conflicts, the geology can become overlooked. One day the Earth here will show its strength again. Earthquakes are certain; volcanic eruptions not impossible. Jerusalem means ‘city (‘jer’) of peace (‘salam)’. Amidst the turmoil and conflicting claims, it seems that that peace can exist only in hope. But when praying for peace, the threat from the faults and volcanoes should not be overlooked. The Earth too remembers. I wonder if the same sort of effect that is causing magma to build up under Norway is what causes volcanoes on the Arabian peninsula? There are some similarities between the two areas, except that the red sea is much younger and might not last much longer in geologic time – there is nowhere for the spreading center to push into now that the middle east has collided with Asia, and it isn’t going to be able to push Africa west… Maybe it will end up being the failed rift in the Afar triple junction, despite being the most developed part at current. “…there is nowhere for the spreading center to push into” I beg to differ.The Zagros mountains are where it is pushing into. They serve much the same purpose as the transverse mountains in California. Geologically, the San Bernardino Mountains are pushed up by the same process growing the Zagros Mountains. California’s Salton Sink is a pull apart basin similar to the Dead Sea region. The fore-arc basin that forms the Persian Gulf and the Fertile Crescent is similar to the Ganges basin in India and Bangledesh, Which is also a fore-arc basin in front of the Himalayan range. It’s all just this regions manifestation of the Wilson Cycle. Just kidding. But there will be quite a variety of opinions on this even among our readers. I have no problem with people choosing to believe in the creation story. It only causes problems if scientific evidence is distorted to make it fit. And science is great as long as it doesn’t claim moral authority, for it turns out scientists are just as fallible as everyone else. Plurality is the future. It will have to be one of the super-admins. I don’t have access to that. Update from HVO at 04:54 am. “A collapse of the Puʻu ʻŌʻō crater floor Monday afternoon on Kīlauea Volcano’s East Rift Zone has prompted increases in seismicity and deformation along a large section of the rift zone, with seismicity currently occurring as far east as Hwy 130. A outbreak of lava in a new location is one possible outcome. At this time it is not possible to say with certainty if or where such an outbreak may occur, but the area downrift (east) of Puʻu ʻŌʻō is the most likely location, as this is where seismicity and deformation have been concentrated overnight. Almost reminiscent of the switch to Kupaianaha? This is bigger than that though, even if nothing happens right now, this intrusion is now the lowest point on the magma system so if the summit decides to drain then there is nothing to stop it. Almost all intrusions at kilauea aren’t actually failed eruptions, just that the eruption doesn’t always happen immediately. The 1924 intrusion erupted 31 years later in 1955, a small intrusion in 1955 later erupted in 1977, and probably every decent intrusion into the upper east rift since 1975 has later erupted at pu’u o’o at some point. However given that the conduits to pu’u o’o are still open (apparently the 61g flow is still active, probably not for much longer), this new intrusion is going to get increasingly pressurised and probably will erupt within this year, if not this week. If halemaumau drains into the east rift then this is where it will end up now. This is a very big change in the eruption, probably the biggest change so far. I think the shallow swarm of earthquakes above kalapana is related to the flank sliding, but HVO has said the intrusion has reached down to at least where the highway crosses the east rift, so any eruption at all could be a big problem. I guess the earthquake map hadn’t updated yet when I last looked at it, or I forgot to set it to lower magnitude earthquakes. Morning has broken. The Kilauea lava pond is still there, looking nice and fiery. The Pu’u’o’o cameras show impressive fog, but the glimpses did not show either big holes or bright flows. There is one camera showing smoke in the forest in the east rift zone but that could be anything. Still waiting for the HVO oracle! heavy rain, I think. And regarding PGcam, it seems an artifact on the lens. I noticed the PO cam clock is running but the cams image is frozen. According to this article it is indeed ash (click through the image slideshow and read the captions). I am a little worried about the PScam. A couple of days ago you could see some incandescent glows on the left side of the picture near the crest of the cone. With the other cameras working now, but this one looks like it has some “??? ?” on it. It is showing a time that is similar to the other cameras, so maybe it is still working. What’s significant to me is that Puʻu ʻŌʻō crater floor has collapsed, an intrusion is occurring downrift – but the summit lava lake is *still* rising and is close to overflowing. This suggests to me the possibility of some breakdown in the conduit to Puʻu ʻŌʻō, and, just possibly, the establishment of two, less connected, magmatic systems. It also suggests we may be living in interesting times. Yes. 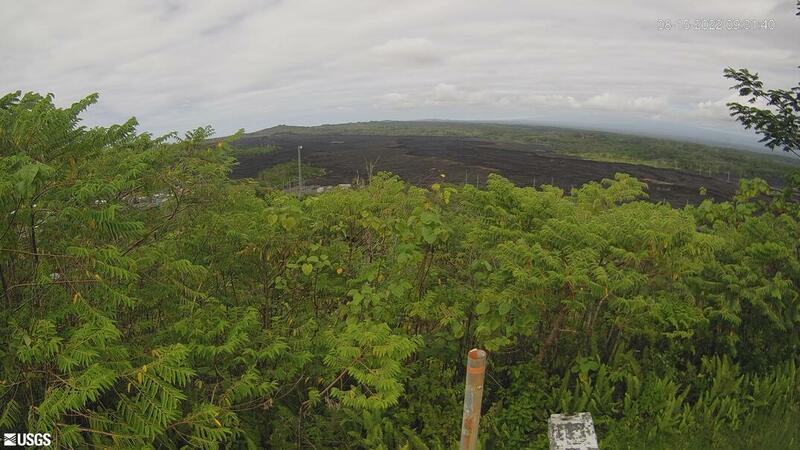 HVO has confirmed that they think magma has intruded into the lower east rift zone. But it has not as yet broken through. The amount of magma involved in the rift extension is so far small I think. The Kilauea lava pond was rising anyway because of the DI recovery, and perhaps this rise was just slowed down a bit. The most recent tilt data seems to suggest that Pu’u’o’o has begun to go down a bit more but it is hard to see at this scale. If nothing happens in the next few days, the intrusion will solidify and the previous behaviour will resume. If it finds an outlet (most likely near the tip if it happens soon), the lava pond should depressurise quote fast, I think. Interesting times – this is one development I had not expected. I thought it would break at the west side of Pu’u’o’o. And I went downrift – but thought SW rift and/or intracaldera was most likely! I didn’t expect this to go so far so fast, or down that rift! I just wonder if there isn’t some tectonics at work too; be it noted that several earthquakes, including the largest, happened offshore. Complex mechanism? Intrusion destabilizing that area slightly? Or tectonic slump opening pathway and ‘encouraging’ magma to migrate down there? Chicken and egg? An eruptive fissure in or near Kalapana would not be good; I’ve stayed down there on a couple of my trips and they’ve had it pretty hard already. Eruptions can’t happen actually IN kalapana, it isn’t on the rift zone, it also might be a bit far west of where the end of this dyke is for it to be in danger from a lava flow too, the areas at risk are the subdivisions that are actually on or near the crest of the rift zone – including Pahoa again (going back to finish what was very briefly started?). We spent a night down there on Lokelani St.. It was really neat to see the glow of the lava as it made its way down the hill. We could also see the steam from the lava entering the ocean. Would highly recommend it if you are able to make it out there. It wouldn’t solidify in a few days, more like at least a few months and maybe way longer. The east rift of kilauea is full of residual magma from past eruptions. It is very hot inside, and also partly molten in the core of the east rift down to at least napau crater, and probably now to pu’u o’o. There is apparently a residual magma body under the 1977 vents that very likely would have been intercepted by this intrusion. This would have probably evolved a fair bit in the 41 years since then, and if the 1977 magma started in 1955 it would have done so even more, so the composition of any magma that erupts from this new dyke is going to be a bit weird, maybe also more explosive? Far from solidus. 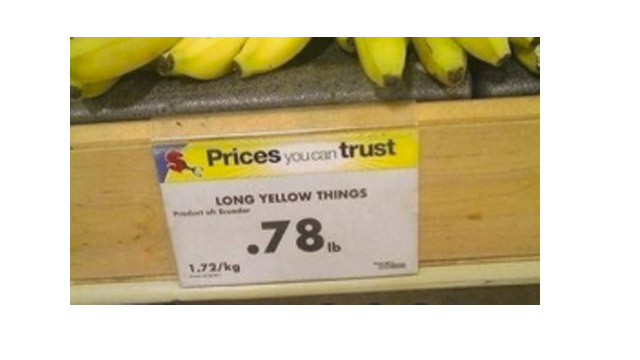 “maybe way longer” applies. As for the “castle” idea… concrete has a density of about 2700kg/m³. (about the same as granite) Basalt is around 3100kg/m³. Wouldn’t the blocks float away on the magma flow? And as for concrete… it is highly prone to spawling when it gets radically heated. Also if you have some way of solidly sticking the concrete blocks to the foundation then the lava won’t get under it, and it can’t really spall off much when it is buried in the lava. A 2 meter thick and 10 meter high wall would very likely block any lava flow unless the flow got dammed. It isn’t going to stop a fissure erupting through it though. Because your house would technically be there still you also wouldn’t lose your land either, which seems to have happened to the former residents of kalapana (which is now marked as rural/agricultural instead of residential). Unironically if I ever lived in puna I would actually consider this idea. They show a new 3.5 at -.4 depth (miles) but it shows in the water? It has been checked and now shows 3.7 at .5 miles. And an article on gas and earthquakes at Istanbul! Of some vague relevance to your excellent articles, Albert! Weather over the next few days may hamper any looks or overflights. This includes some periods with high wind warnings for the two big volcanoes on Hawaii. HONOLULU (KHON2) – An upper-level disturbance is forecast to ramp up showers for all islands starting Wednesday. Showers may be heavy at times. The wet weather is expected to last through late Saturday, especially from Maui County west to Kauai. Looks like quite a strong eruption at Marapi in Indonesia, ash up to 30,000ft, aviation colour code on red on magma indonesia site. Oh now the VONA has been replaced with one that is orange but says ash to 50,000ft?! VAAC says ash to 22,000ft. Anyway, definitely a moderate explosion. Did the pu’u o’o GPS fall into the crater? The graph hasn’t updated since before the collapse happened, and the GPS shouldn’t be effected by rain or earthquakes like the tilt-meters. That would also make it hard to tell exactly where an eruption would start until it actually does start, which basically makes the area as dangerous as standing on top of hekla, and for the same main reason. The civil defence have noticed this, however, and have closed the road past this point. The flank has moved and opened a space for magma to collect, and now that space is filling/has filled. It is also now the lowest point in the system, according to the earthquake map the area where the road crosses the east rift is at about 320 meters above sea level, and the former crater floor of pu’u o’o is at just under 900 meters above sea level, so it would make a lot of sense for an eruption to happen from this new intrusion even if nothing happens right now. It probably wouldn’t take much for the dyke to surface if more pressure was added, say by magma returning to pu’u o’o, or by the summit draining down the rift. If the average rate of flow to the east rift is about 10m3/s (which is apparently what the 61g flow was up until a few months ago), then that means that much magma is still going into the rift, it is just not erupting now because there is a void, and when that void fills then the pressure will increase until it finds an outlet. That outlet could be at pu’u o’o again, but if there is at least 500 meters difference in elevation between the ground above where the intrusion ended and pu’u o’o then that is a big difference. If the intrusion was 1 km underground at pu’u o’o it would be only about 400 meters underground at the road, and the rift isn’t exactly solid rock so this wouldn’t be a challenging spot to erupt. It would be pretty unlikely but if the summit drains down the southwest rift and starts erupting while enough magma feeds into the east rift to start an eruption, then combined with the fact that the 61g flow is somehow still active (HVO hasn’t confirmed that it is actually dead so I’m giving it the benefit of the doubt), there could be 4 simultaneous eruptions at one volcano. That would be something for the history books. I must say that this is not at all what I would have expected last week. I did bring up the possibility of it intruding down the rift and erupting but was mostly bringing it up as that 1% chance that is usually negligible. I thought it would be much easier to push through ~300 meters of gravel than 15-20 km of rock. Actually HVO has released some images just now, and there was a very small eruption on the west flank of pu’u o’o, but it is hard to tell exactly where it is from the picture, but it is on pu’u o’o and not the adjacent rift zone (where the 2011 fissures were). It doesnt look nearly big enough to explain the collapse on its own, so something else happened somewhere. The tilt has started to go down again, enough to be visible on this microscale. That suggest to me a breakout may have happened somewhere. Albert could you please give a link to the HVO seismograph plots? Or is it restricted? Right-hand side: Instruments Visible > Seismometer > Click on each triangle on the map to bring up the plots. This is a problem on Vodafone’s end. They’ve opted to flag everything under the i1.wp.com domain as adult content on their platform. This consequently impacts every site that uses Photon, and every user using Vodafone UK for their broadband and its parental controls will see broken images, regardless of what the image is, and what site it is from. Good old heavy-handed censorship… Can you submit the domain for reclassification with Vodafone so you can see the images? I’m on Vodafone for mobile data, but I see all images in both the back/front end, default Vodafone settings (I assume adult=off is default) – maybe it’s different filtering between broadband/mobile. Either that or use a VPN/Tor to view the site. It seems Vodafone has a habit of injecting certs in between end user and server, a man-in-the-middle ‘attack’. We use it on our school’s network to decrypt traffic so we can ‘see’ into the matrix. I’m rather late to this party, but want to thank Albert for this two part series. Very interesting!